ARE YOU READY TO ALIGN WITH YOUR SOUL’S AGENDA? Come to Paradise and reclaim your power. Our Five-Day Retreat is the answer to your questions in this time of tumultuous change. These small-group retreats are intended to give you the individual attention that you need to truly change your life. Relax into the beauty of the Big Island of Hawaii. Learn frequency releasing to break free from old patterns. Rest and nourish your body with crystalline-based sounds, healthy food, and the peaceful, grounding nature of Hawaii. Bring your tired, fractured body and mind for a complete transformation. Spend five days immersed in self-care, to Realign, Revitalize and Remember the Divine Essence of your True Nature. 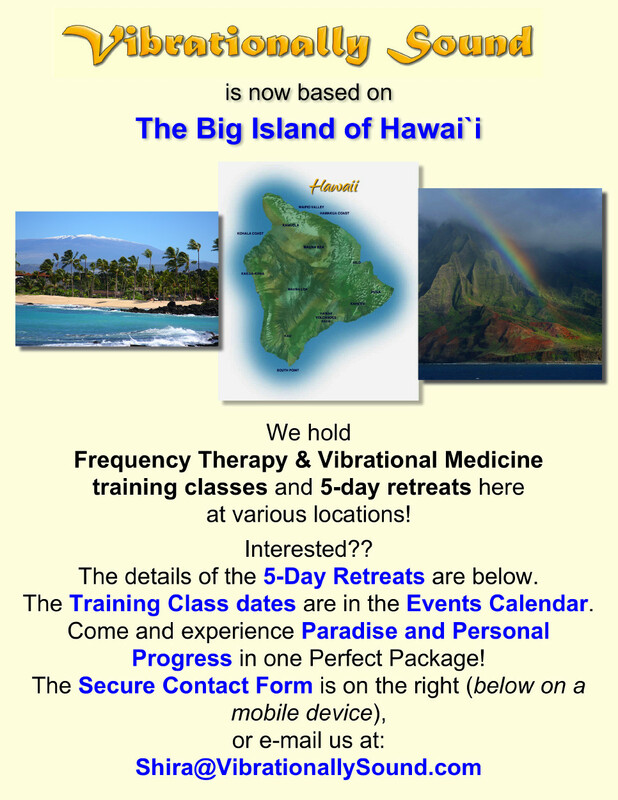 The Vibrational Medicine Therapy will change your life. THE TIME IS NOW! The planetary shift is in motion. We are in the quickening of evolutionary growth. Join us and let this retreat bring you into alignment to remember your Spiritual Purpose and experience the highest expression of your Soul’s Agenda. This small retreat environment will provide a safe space to honor your issues and fears, and bring power to you so that you might change the old patterns and realign with your Soul’s agenda. You will gain an understanding of how your mental, emotional, physical and energy bodies are constructed and driven by Vibration, Frequency and Sound Waves. You will be learning about vibrational medicine and how to use it to bring the body-mind-soul alignment back to its original blueprint. You will experience new ways to support and nourish yourself to heal your heart and to change your world. Breathtaking Research and Evidence of the power of Frequency Entrainment. The tools that you will learn in this deep immersion retreat are a combination of Ancient teachings and modern revelations in the frequency entrainment world. You will be partaking in the use of these tools daily to shift and change your frequency patterns. This day will incorporate a heart process that will realign you with your heart and its deep desire for the highest good. The Truth about the Real Tuning of the Body and Gaia. What the media world doesn’t want you to know. Have you tried many avenues and nothing seems to give you the lasting change that you truly wish to have in your life? Are you hungry to feel deep passion for your journey on this planet? Do you wonder what your purpose is and find that you are constantly seeking it? On this day of the retreat we will reveal to you how your cultural teachings and memes have taken you into a pseudo-life. We will reclaim the REAL you through fine tuning your creative center. What Role does your Mind play in the Frequency Entrainment Process? We will discover some powerful tools on this day that will change your way of thinking forever. This work will help you understand why you act and do the things that you do. We will deeply research the aspects of your mind that keep you from accessing your God Power. Come prepared to clear all history and embark on a brand new dream life. Creating the Game Plan for Divine Alignment. This day will be spent fine tuning the new tools and skills that you have learned, in reference to the issues that you came to clear and heal. We will create a healing circle in which every person will be immersed in the healing sounds for their own personal entrainment needs. Shira will do a powerful group frequency entrainment process that will open the portal for the deep healing work that you have done, to ground, connect and integrate into your energy matrix, to ensure that you carry the completed frequency shift home to continue your evolutionary process. Please use the Secure Contact Form (on the right, or below on mobile devices) to connect with us about these 5-Day Retreats. These are Small-Group Retreats that are specifically personalized around the attendees, so that you obtain the absolute maximum benefit from your stay and experience with us here in Paradise. Reserve your space – and prepare for change!! $450 / Single – Discounted Price for Two (2) Attendees when booked together = $850 – for 5 days – Transportation not included – Accommodation and Meals additional – Information on local options for these two latter items can be provided (if required) prior to booking – please connect with us to discuss.